I’ve been doing some commissioned knitting, so sadly my own projects were on hold for a bit. But I’m still making good progress on my colourwork sweater, and I still looooove it. I’m almost up to the underarm though, so I need to figure out what I want to do about the sleeves! seamless raglan: would have to continue the colourwork onto the yoke, but then do I want the whole sleeve to be colourwork? Or just the shoulder? sewn raglan: this might be a good choice, for solid sleeves. Steek for the sleeves or work back and forth? sewn set-in sleeve: this would also be good for having solid coloured sleeves. But again: to steek for the armhole, or work the front and back separately, in flat colourwork? I’ve had some decent practice with flat colourwork this past week, but I’m worried that my gauge will be markedly different from the in-the-round body. Plus there’s the whole not-enough-background colour thing. If anyone sees Koigu KPM 2416 for sale anywhere will you let me know? 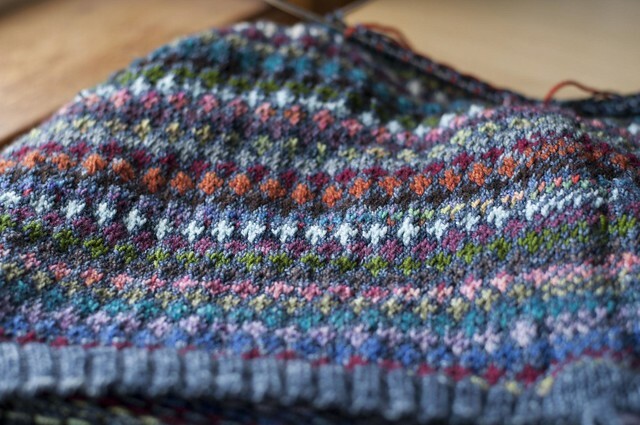 Clearly I don’t always plan thoroughly before I start knitting – sometimes I do have a fully formed picture in my head, but other times I just want to knit and see what happens. I’m participating in this year’s Indie Design Gift-A-Long. 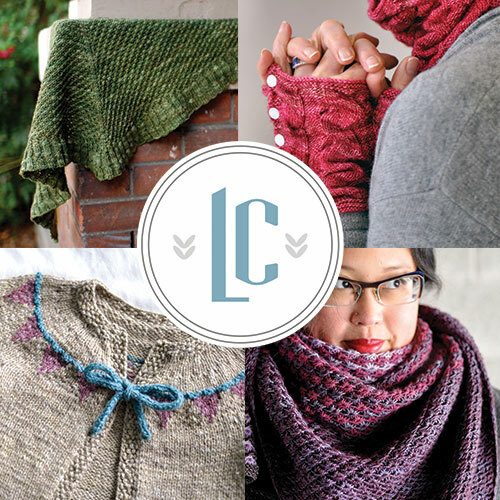 The Gift-A-Long is a huge (HUGE) knitalong for the holiday season, with a sale, prizes and lots more good stuff. I think one of the exciting things for me is to see just how many awesome patterns there are out there. From 8pm EST tonight (Thursday November 13) to November 21, tons of independent designers have THOUSANDS of patterns on sale, including me! Click on the image to see my 20 Gift-A-Long eligible patterns. Then until the end of the year, you can post works in progress, chat with other people doing the same, and have the chance to win tons of fabulous electronic and physical prizes. The Gift-A-Long team has been doing so, so much work to get ready for this – check out this amazing infographic on the stats (click for bigger). 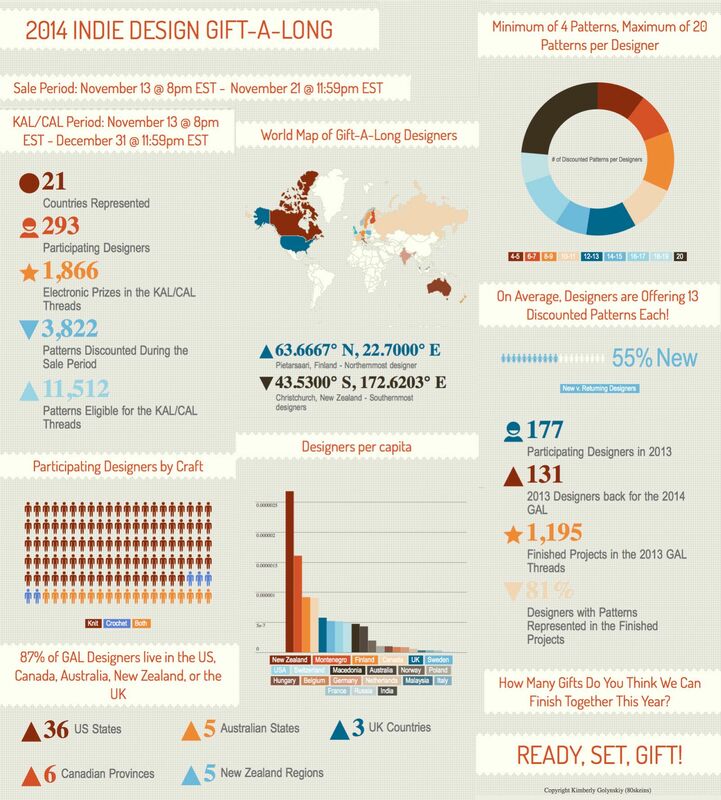 Get all the details and join up in the Indie Design Gift-A-Long group. 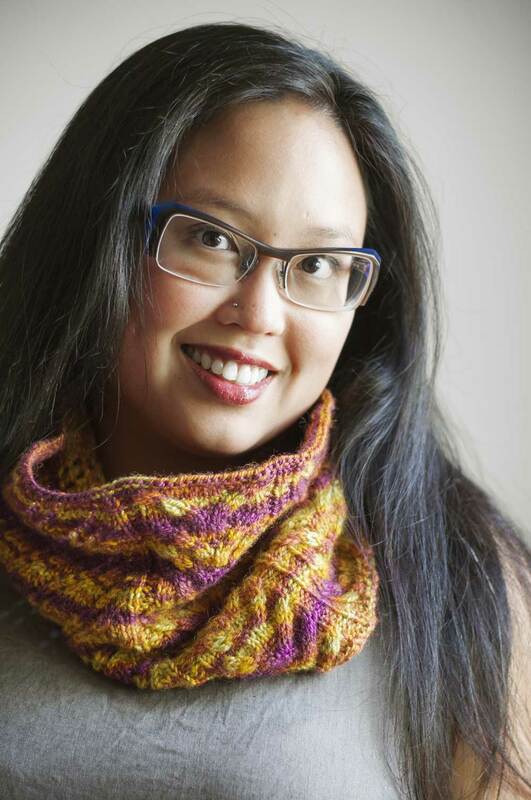 Use the discount code giftalong2014 to receive 25% off eligible patterns – but not until 8pm tonight! Got your needles warmed up?